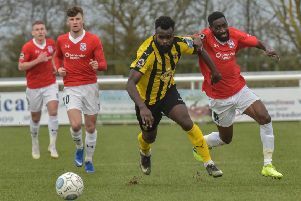 Scott Easterlow has seen his side slip off the pace in the Midland League Division One promotion race. 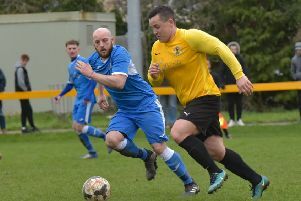 Racers’ promotion hopes suffered a severe setback after a second defeat in three saw them slip to third in the table, ten points behind leaders Heather St Johns. More worryingly, they have now conceded seven goals in their last two home games to hand the initiative to Atherstone in the battle for the runners-up spot. “The decision-making in the last two game s has been awful, hence the seven goals we have conceded,” admitted Easterlow. “Saturday’s performance was terrible through a severe lack of desire and workrate mainly, from too many lads all in one day which is something I never thought I would say. “We will keep going until the death as all the top sides still have some tough games so anything is possible. With Luke Cole and Lewis Hayden missing through suspension and George Curry, Alex Price, Chris Johnston also out, the Racing bench was left looking sparse. Nevertheless, into a strong wind, Racing Club quickly clicked into gear and opened the scoring in the seventh minute, Trea Bertie rounding the keeper and thundering home from a tight angle. Ben Mackey had a glorious opportunity to double the lead from the penalty spot in the 15th minute. However, after several attempts to keep the ball still on the spot, he appeared to rush his eventual shot and the keeper saved well with his feet. Mackey then produced a stunning cross for Bertie but the keeper saved well. The hosts were punished four minutes later when a fantastic drive from distance from James McGrady beat Charlie Bannister in the Racers goal. The home side responded well and Danny Bartle produced a composed finish at the far post from a Henry Leaver cross to restore their lead. With the wind behind them after the break, Racing Club were confident of going on to win the game and Mackey almost made it 3-1 after turning strongly, only to fire into the side netting. Brocton looked dangerous on the break and were rewarded with an equaliser in the 68th minute after Jack Weldon took advantage of a defensive mix-up in the area. Just a few minutes later they took the lead through Matthew Kimmins and the game was put out of reach in the 86th minute when substitute Tyrell Riggon fired home from close range. Mackey had the ball in the net late on for the home side but was adjudged offside.